NEW YORK (TheStreet) -- Rebecca Mairone was a mid-level Countrywide executive in a hurry when the housing market was booming. And that life choice has cost her $1 million, and a public shaming. The $1 million fine to a woman whom U.S. District Court Judge Jed Rakoff on Wednesday described as "a relatively new employee who had to prove herself," was handed down by the judge as a penalty for what he called "an intentional scheme to misrepresent the quality of the mortgage loans that [Countrywide] processed." Mairone worked on a program know internally at Countrywide as the "High Speed Swim Lane" (HSSL) and the "Hustle." Loans issued through the program were then sold to the so-called government-sponsored enterprises, Fannie Mae (FNMA and Freddie Mac (FMCC . Rakoff also fined Bank of America (BAC - Get Report) which bought Countrywide in 2008, roughly $1.26 billion over the same scheme, which a civil jury had already determined to be fraudulent in Oct. 2013 in response to charges brought by U.S. Attorney Preet Bharara. "Evidence of the defendants' fraudulent scheme and fraudulent intent was ample," Rakoff wrote in his 19 page opinion. 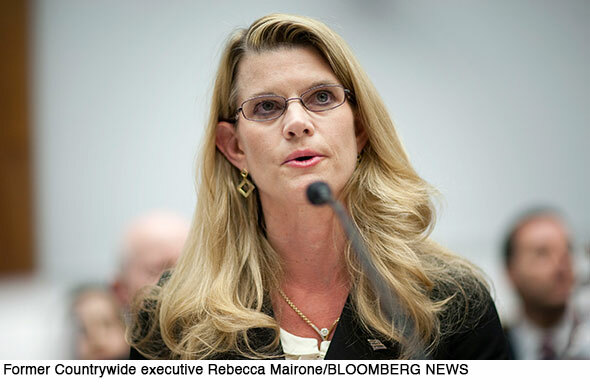 Mairone was the scheme's "catalyst," according to Rakoff, choosing a word used by Countrywide's own employees to describe her role. "Despite her implausible testimony to the contrary, from which the Court draws an adverse inference, there was convincing evidence that Ms. Mairone - the relatively new employee who had to prove herself - most aggressively pushed forward the HSSL fraud and most scathingly denounced those who raised concerns," Rakoff wrote. He cited an instance where an employee "relayed to Ms. Mairone a lengthy list of concerns about the erosion of loan quality under the HSSL program." In response, Mairone "not only gave his concerns the back of her hand but also directed thereafter that quality assurance reports be sent only to her rather than distributed more widely, that loan specialists no longer be notified of errors in their HSSL loans, that the quality-assurance checklist be eliminated, and that other changes be made to increase volume and sales at the expense of quality." "We continue to maintain that Rebecca never intended to defraud anyone and never did defraud anyone. Unfortunately, more powerful people chose her as a scapegoat because they thought she was an easy target. We will fight on to clear her name." Still, he added, "the fact that other, higher-level individuals arguably participated in the fraud but were, for whatever reason, not charged by the Government, does not significantly lessen Ms. Mairone's culpability for her leading role in the fraud." Mukasey, who in March told Reuters Mairone now goes by her maiden name of Steele, declined all further comment. Mairone was employed at JPMorgan Chase (JPM - Get Report) until July 1, according to an email Wednesday from bank spokesman Jason Lobo, who did not respond to additional questions. Mairone will not pay the $1 million in one lump sum because Rakoff believes "while she is certainly not a candidate for welfare," doing so "would strain her resources to the limit." As a result, she must pay 20% of her gross income per quarter until the fine is paid. As for Bank of America, spokesman Lawrence Grayson wrote via email that "We believe that this figure simply bears no relation to a limited Countrywide program that lasted several months and ended before Bank of America's acquisition of the company. We're reviewing the ruling and will assess our appellate options."